This is pretty much an abridged description. I’m adding a few words to some of the headers in the diagram although I think they are pretty self explanatory. If you think I got anything wrong or missed anything let me know in a comment. I’m doing this because I think it will be useful in the work I am doing for the company I currently work for, as well as the startups I mentor. NOTE: This is generally applicable to a technology company in service of its customers. And while we can show the path to them (the customer), we cannot walk it for them. As I wrote in this post, you cannot outsource success. By this I mean progress against the strategy and execution plan. It will generally cover things like whether actions planned have been carried out. It typically happens in periodic sessions, like monthly and/or quarterly reviews. A customer success manager (CSM) is not a support manager and a robust support service and team should be in place for that. When things are not resolved for the customer through this path, the customer can escalate to the CSM. Again, the CSM is not a product manager but provides a window to them for the customer and vice versa. The purpose is to take ideas and thinking for what the ideal product should be to either party. Things like product roadmap, new feature requests, etc. are covered. Probably one of if not the most important roles in my view. 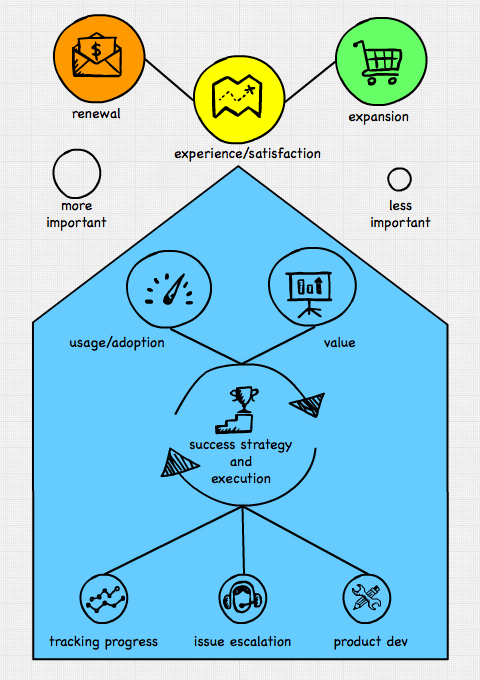 Not that I think a huge amount of time needs to be spent on this – if anything it should be lean, iterative and open to change as I wrote in this methodology: Lean startup methodology applied to successful enterprise technology adoption. The thing is that all success flows from this when it is done right. This is really about one of the most important metrics to the CSM. Having a view on whether users are using the system and where (which features) as well as over time, is critical. Providing dashboards that provide these views is critical. If you can track success activities against usage (i.e. what activities you plan with the customer and how these impact on usage), then you have discovered the holy grail. If you can track against other parameters like value and satisfaction, so much the better. Maybe this is more important than usage. Although you have to have usage first before you can get to value since only when a platform is adopted and being used can you drive value. The fundamental point of everything a CSM does is geared towards driving and showing the value a technology provides in relation to investment or effort. This is arguably the hardest part of the CSM’s role. One leads to the other. The CSM is not entirely responsible for either because experience for instance is made up of many factors outside of his or her control. The product plays a big part for instance. Other departments that touch the customer, starting with sales. And many other factors. But the CSM could be seen as the custodian of experience. If positive it leads to high satisfaction levels. This should be measured. Net Promoter Score is a popular means used by many but there are other ways. Also arguably one of the major outcomes a CSM is expected to influence, if not be responsible for. Making sure the customer is deriving value from their technology investment and satisfied with their experience leads them to renew their subscription when it comes time to. That is, as opposed to allowing it to lapse, or churn as it is known in the industry.